Who says a pickup truck can't be fun? Not Ford. The F-150 Raptor is a favorite among our customers at Don Rich Ford Co Inc for off-road work and adventures. Just because it's a workhorse doesn't mean it can't look good. The latest version of the F-150 is designed to turn all heads. The F-150Raptor is lean and mean and nearly 500 pounds lighter than its predecessors. It's just as tough thanks to its high-strength, military-grade, aluminum-alloy body, while the Terrain Management System and Trail Control give you the control you need to travel easily through any type of country. 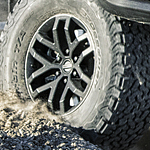 For added traction, select the available beadlock-capable wheels that will give you more grip when you need to drive on challenging terrain. Fox live valve shocks will keep your ride as smooth as possible by automatically adjusting the suspension. You also get one of Ford's EcoBoost engines for more than enough power.